Similar to most Linksys routers, the Linksys WRE54G Wireless-G Range Expander (WRE54G) also has firmware upgrades that can enhance and improve its features. However, you should always remember that upgrading the firmware is advisable if you are experiencing problems with the range expander or the new firmware has a feature that you want to use. Before proceeding with upgrading the range expander’s firmware, you need to make ensure that you have downloaded the latest firmware from the website. For detailed instructions on how to do this, click here. IMPORTANT: Steps on upgrading the firmware of the range expander may depend on the version of the device. Click on the links below for instructions. Upgrading the firmware for WRE54G version 1 requires you to connect to the range expander’s network wirelessly. This is because this version of the range expander does not have an Ethernet port where you can directly connect the range expander to the computer. 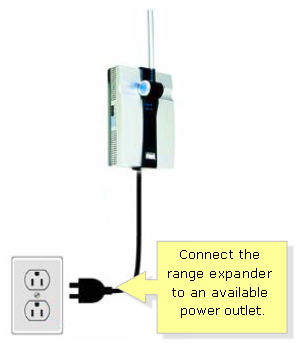 Plug the range expander to an available power outlet. On your computer, click the wireless icon on the System Tray to view the available wireless network connections. 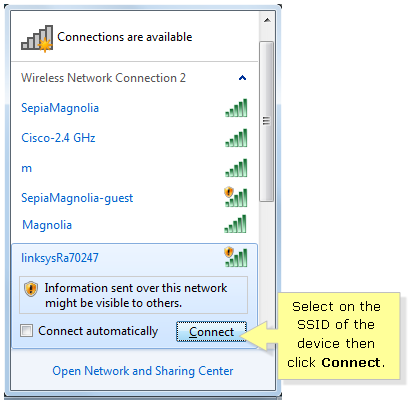 Select the wireless network name (SSID) of the range expander then click Connect. NOTE: In this example, the SSID of the range expander is linksysRa70427. The default SSID of the WRE54G is linksysRxxxxx where xxxxx refers to a set of alphanumeric characters. Once connected to the range expander’s wireless network, you need to assign a static IP address to the computer. For detailed instructions, click here. NOTE: In this example, the static IP address used was 192.168.1.5. 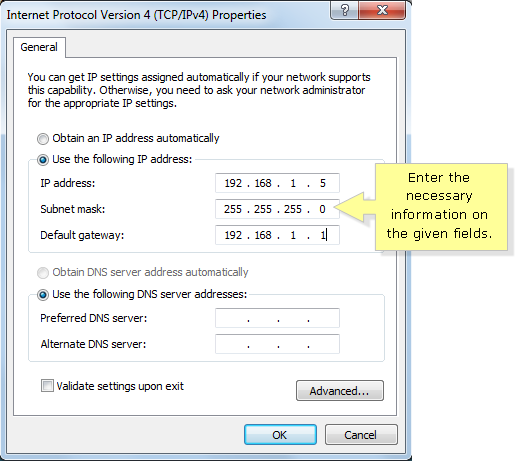 Make sure that the static IP address used falls under the IP address range of 192.168.1.x. On the range expander’s web-based setup page, click the Help sub-tab then click on the Firmware Upgrade button. On the Upgrade Firmware window, click the Browse… button. Browse the location where the firmware files were extracted. 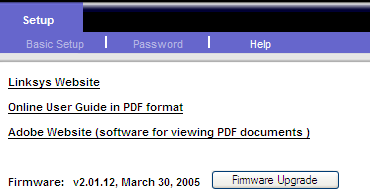 Select the firmware file then click Open. The WRE54G versions 2 and 3 have an Ethernet port so you can directly connect to the computer using an Ethernet cable. Refer to the image below for an example.